Hello, everyone! Happy National Library Week! Oh… I guess I should keep my voice down in here, I just get so excited about this special week that celebrates libraries every year! As your resident librarian, I feel that I should highlight some of the quintessential threads around the Sims forums for the SimLit enthusiast! 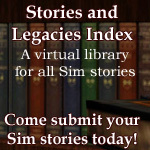 The Stories and Legacies Index – Did you know that the Sims forums have a library of SimLit? It’s true! This user-submitted link directory hosted by yours truly currently has 273 listed SimLit sites (no really, I’ve counted!) that range from The Sims to Sims 4! No matter the Sims game, no matter if the story is plot-driven or game-driven or something in-between, no matter if you are a popular author with a large following already or brand-new and just starting out, all Sim stories are welcome! There are no limits on format of creativity, either; a text-only Sim story or a video Let’s Play or Challenge are just as welcome as anything else! So if you still have not stopped by and added your story to the stacks of this library, please consider doing so now! Weekly Reading Roundup – This is a readers’ advisory thread where every week I sample a selection of SimLit on a theme and then briefly discuss key information such as the current length, plot summary, the writing style, and some of the highlights of the story. This can be a great way to learn a bit more about a story to see if it would be the sort of thing that would catch your fancy, similar to reading the blurb on the back of a book! All featured stories are also arranged by subject in the first few posts of the thread, similar to a subject search in a library. The Writer’s Hangout – Want to promote your story but don’t have the time to chat? The Writer’s Hangout is a place welcoming of link-dropping notifications of your new chapters, so feel free to drop and run… here, it’s totally okay! This is also a great place to scan for story titles, since most folks here use graphical cover images on their ads which may help to catch attention, much like the cover of a book. Book Club – Do you love reading SimLit? Join the book club hosted by CathyTea! Every week is a new story for you to enjoy, with guided discussions available every Friday! There is also a listing on the front post of all past titles, which can be used as a great reference if you are looking for something new to read! Project Index – This thread invites readers to sample works listed in various linked indexes in the opening post, and then to discuss their readings on the thread. This can be a great way to learn more about the SimLit in the community, share your reading experiences, or ask for recommendations! Monthly Story and Legacy Shoutouts – This thread is for spreading the word about your favorite stories. Do you have a Sim story that you love? Then please drop by this thread and give it a shoutout! All shoutouts made will be specially featured at the The Stories and Legacies Index for an entire month! A Quick Guide to SimLit – This guide by Julyvee94 is excellent for those getting started in SimLit! If you are thinking about writing SimLit and have no idea where to start, this guide will get you pointed in the right direction! Helpful Guides For You – A WordPress site by SilentWolf101 with many helpful tutorial guides for SimLit authors! You can find basics for setting up a WordPress site, using the Sims forums, and using custom content and creating poses on Sims 3, and she is always willing to add more guides as new topics come up. Short Story Challenges – Do you love short stories, or just want to try your hand at theme writing? Check out the Short Story Challenges hosted by Carewren123, where every month there is a new theme to write about in 500-1500 words using 1-12 screencaps. Challenging, but so much fun both to read and write! This thread is warm and welcoming of all authors, so even if you are a new writer, we’d love to have you! This is a great way to get practice; I can say I believe I’ve become a better writer myself from challenging myself with the short story themes each month! The Art of Storytelling – Looking for thoughtful discussion on focused topics about writing SimLit? Then check out the Art of Storytelling thread hosted by MedleyMisty! Whether you are a new author or have finished legacies under your belt, all are welcome to share their experiences and ask questions! This can be a very insightful thread for the SimLit writer! The Writers’ Workshop – Looking for some guided help on your stories? Need some critical feedback or other guidance or help with writing? Then check out the Writers’ Workshop to get specific help on your work from other writers in the community! Looking for friends that are fellow Simmers that love to read and write SimLit? There are actually two sections of the Sims forums where the SimLit community hangs out: Stories and Legacies and Sims 4 Stories and Legacies. Leave your pre-conceived notions about the game you play at the door: both of these sections welcome Simmers from any Sims title to stop in and make themselves at home! Sims and Friends: Share Your Stories!! – The official “hang out” of the Stories and Legacies section, hosted by SilverDaybreak. This is a slower-paced thread, which makes it ideal for keeping up with discussions and commenting directly to folks. Writers’ Lounge – The official “hang out” of the Sims 4 Stories and Legacies section, hosted by CathyTea and friendsfan367. This is a fast-paced thread which is ideal for just dropping in and taking part in whatever the current topic happens to be at that particular moment. Both threads have their own styles of communication, but are proud sister threads with each other that promote hanging out, chatting, making friends, sharing your creative works, and asking questions with fellow Simmers, so please check them out! If live chat is more your thing, feel free to check out SimLit Chat on IRC. This link is a browser-based IRC portal that only requires you to enter a username name and hit connect! No complicated accounts or software! Please be aware that is it normal for folks to “idle” sometimes on IRC, so if no one gets back to you, they are likely just away from chat or unavailable; someone is always bound to come around and be willing to chat as soon as possible! I tend to be around in the evenings, Mountain Standard Time Zone! 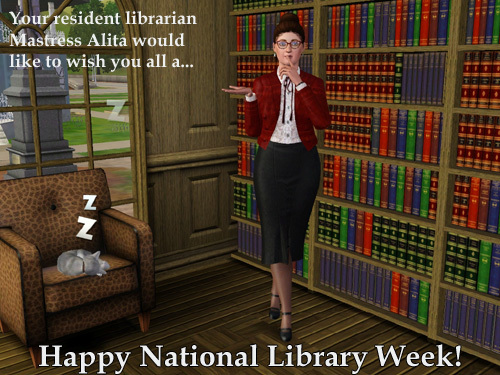 Happy Simming, happy reading, happy writing… and Happy National Library Week! This entry was posted in Holiday Cards and tagged character: Casanova Kitty, character: Mastress Alita, game: Sims 3, site: holiday card, site: news. Bookmark the permalink. 3 Responses to Happy National Library Week! What a great post of resources :D happy national library week to you, too, and thanks for being the greatest sims librarian! And Happy National Library Week!